Pregnant women, rejoice! 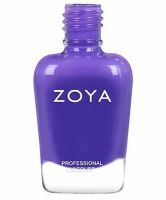 This top polish comes in more than 240 colors and doesn't contain toxins like formaldehyde and toluene. But the thick formula makes application difficult, so dab it on sparingly. One coat does the trick in most cases, and it can last an amazing three weeks on toes. Hands? Different story. Polish never lasts long on my fingers due to excessive typing and nail biting, and Zoya is no exception; the color chips within days. I feel good about using a non-toxic nail polish (the strong scent didn't bother me as a teenager, but it does now). It covers easily, with a great texture. Oh and the shades--there are shades for every woman to fall in love with! This didn't last any longer than other polishes, but I love using it. I have Gilda (a hot sparkly pink) and it is one my favorite nail polish colors ever! They're website has so many great choices at a reasonable price! With a top and a base coat, my nails still chipped after 2-3 days though. Overall, these nail polishes are excellent. With a few colors I experienced some bubbling, but that was few and far between. They are incredibly lush polishes, long lasting, and have great depth of color.